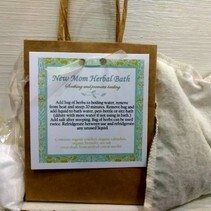 Baby is here, now mama can take care of herself with Earth Mama Organics' Herbal Sitz Bath. These herbal sachets are filled with organic herbs traditionally used to soothe perineal discomfort in postpartum mamas. These compresses can be cooled and tucked into your undergarments to ease any discomfort you have or you can use the brewed infusion to make postpartum "padsicles" or use as a sitz bath, which is basically like making a nice cup of tea just for your nether region. Lay herbal pad in a shallow bowl and cover with boiling water. Let steep for 5 minutes, then let it cool. Carefully drain extra liquid from pad, so it is moist but not soaking. Save remaining liquid. Be careful to not squeeze, as the pads are fragile and can break open! Cool in the fridge and apply pad directly to perineum. Enjoy! But don't throw out the remaining liquid just yet! You can make "padsicles" by pouring the remaining liquid on a regular postpartum pad and freezing it for a clever, homemade perineal ice pack!